Weekend breakfasts and brunches were of two kinds in our family when I was a child. If it was just the family on a Sunday morning, my father would be up and in the kitchen at the crack of dawn, rattling pans and banging the cupboards in his best effort to get us kids up and out of bed. By the time we roused ourselves awake and out of bed and would wander into the kitchen the potatoes would be browning and the eggs would have just gone into the pan. And when the bagels went into the toaster we knew it was almost time to eat. If we were lucky, there would be lox to go along with the cream cheese. For many years that was my favorite breakfast. But brunch usually meant company and was a little closer to lunch time, so instead of (or in addition to) the lox and bagels Dad brought home from his regular run to the Three Brothers Bakery he would also bring kosher salami and a beautiful big loaf of Jewish rye. As far as I was concerned, there was nothing that could beat a salami on rye sandwich with lots of ballpark mustard. Oh sure, we had all kinds of brown and spicy mustards on the table as well, but there was something about the vinegary tang of good old regular mustard that perfectly complemented the sourness of the rye and the rich salami. If there was rye bread and salami in the house, I was in heaven. When we moved away from Houston and the Three Brothers Bakery, salami sandwiches never tasted the same to me. Although there was a vibrant Jewish community in Dallas and there was a bagel place that made the best bagels I ever tasted, we couldn't find a nice loaf of Jewish rye to match what we were used to in Houston. There is some question as to what distinguishes Jewish rye from other rye breads, so there is no definitive answer that I have been able to find. 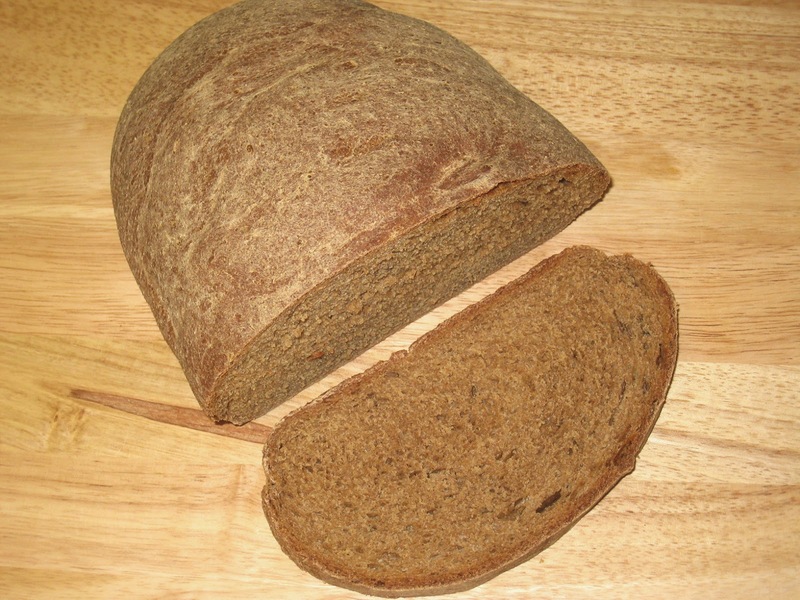 Going by my own experience and the rye bread we ate when I was a child, the main differences seem to be that Jewish rye uses a lighter rye flour and contains caraway seeds. But since these kinds of differences can be regional as well as ethnic, it might be more appropriate to call it Russian rye rather than Jewish rye, since that seems to be true of Russian ryes as well. All I know is that as much as I enjoy all kinds of rye breads, it is this one that evokes all of my sense memories and provides the comfort of childhood memories. I still enjoyed salami sandwiches, but they were no longer my absolute favorite. So when I started to make bread, I began looking for rye bread recipes that might come close to that bread of my youth. Most of my attempts were tasty, but neither the texture nor the taste was quite what my tastebuds were craving. My search finally led me to a recipe in Please to the Table: The Russian Cookbook, a comprehensive collection of the cuisines of all of the countries that were a part of the previous Soviet Union that I had purchased used at the Printer's Row Bookfair a few years ago. The recipe yields the light chewy taste and texture that I remember from those childhood salami and rye sandwiches. It also toasts beautifully for breakfast. It is easy and does not take too long to make. Now if only I could find some decent kosher salami (RIP Best's) I would have it made. The original recipe calls for two small loaves. For that, just divide the dough in half and shape two loaves for the final proofing. Combine the rye, all-purpose and whole wheat flours in a medium bowl, reserving 1/4 cup of the all-purpose flour. Whisk together and set aside. Place 1/4 cup of the water, the yeast and the sugar in a large bowl and stir until the yeast dissolves. Let stand for about 5 minutes, until the mixture is bubbly. Add all but 1/4 cup of the remaining water, the molasses, oil, salt and caraway seeds to the yeast mixture and stir well. Add the flour mixture, a cup at a time, stirring well after each addition, preferably with a wooden spoon. Add water in small increments if it looks dry. When all of the flour (except for the reserved 1/4 cup all-purpose flour) has been added, cover the dough with a kitchen towel and let stand for 5 minute. Turn the dough out onto a floured surface and knead for about 10 minutes, until the dough is smooth and elastic. Add the all-purpose flour as needed to keep the dough from sticking. Pour about a tablespoon of oil into the large bowl and spread it around the bottom. Shape the dough into a ball and place it in the bowl, turning it in the oil so it is completely covered with the oil. Place the kitchen towel over the bowl and set it to rise in a warm place until doubled in bulk, about 1 to 1-1/2 hours. Preheat the oven to 375° F. Punch the dough down and knead it briefly. Shape into an oval and place it on a baking sheet lined with parchment paper. Cover and let rise for about 30 minutes. Bake the bread for about 45 minutes, until the crust is dark brown and the loaves sound hollow when tapped with a knuckle. Cool on a rack.